Featured amenities include wired Internet access (surcharge), a safe deposit box at the front desk, and an elevator (lift). Self parking (subject to charges) is available onsite. The modern 3-star Ohtels Belvedere is located next to PortAventura and 700 metres from the beach. Its facilities include a swimming pool, terraces with sunbeds, a jacuzzi, gymnasium, sauna and Turkish bath, day and evening entertainment programmes, and a restaurant serving international cuisine. The smartly decorated rooms feature TVs and free amenities. The modern California Garden Hotel sits in the tourist centre of Salou, just 150 metres from Plaza Europa and close to the resort’s golden sandy beach. The hotel offers adults and children’s pools, a bar, buffet restaurant, parking facilities and a 24-hour reception service, as well as daytime and evening entertainment. Rooms are air conditioned and offer satellite TV and free wi-fi access. With a stay at Aparthotel CYE Holiday Centre in Salou (Salou City Centre), you'll be within a 10-minute drive of PortAventura World and Llevant Beach. This family-friendly aparthotel is 1.5 mi (2.4 km) from Ferrari Land and 3.2 mi (5.2 km) from Aquopolis Costa Dorada. 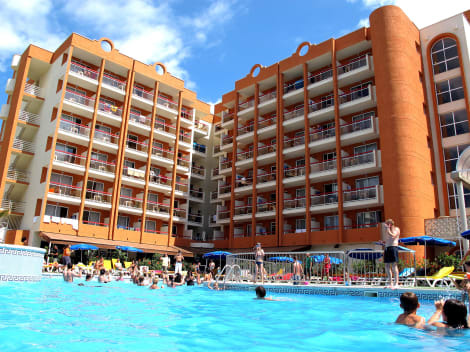 The apartment building is located in the centre of Salou, just 700 metres from the beach. It is surrounded by numerous services including supermarkets, restaurants and shops. There are also links to the public transport network just outside the establishment. The train station is about 700 metres away. Barcelona El Prat De Llobregat Airport is about 99 km away and Reus Airport is about 15 km from the establishment. The complex with a total of 25 apartments offers lift access to all floors. The apartments consist of two bedrooms, a living room with sofa bed for two people, a kitchen with ceramic hob, tea and coffee making facilities, a microwave and washing machine, as well as an en suite bathroom with a hairdryer and bath. The apartments that can accommodate 6 - 7 people offer the same amenities but feature a further single bedroom and an extra bathroom with a shower. All have TV with national channels, air conditioning and heating throughout the apartment, and a large terrace with garden furniture. 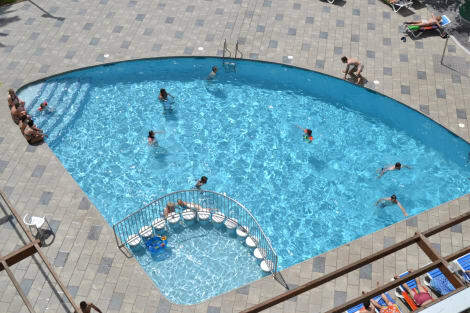 The hotel offers a swimming pool for adults as well as a children's pool. The nearby beach is sandy. Once in the Plaza Europa in Salou , turn to the right to "Paseo Jaime I", go down till the end that you will the way to "Calle Barcelona". Fincas Indasol office is on the same street Barcelona at 150 mtrs on the left side past the roundabout at the fountain. At Eurosalou Hotel & Spa, enjoy a satisfying meal at the restaurant. Wrap up your day with a drink at the bar/lounge. A complimentary continental breakfast is served daily.